Sometimes a found item is valuable like a tin filled with more than $10,000 or a historical memento like lost footage of Neil Armstrong. In the annals of found items this grocery list might be the ultimate case of winning by losing. First Lady Michelle Obama, who has taken up the diets and health of our nation’s children as one of her primary causes while in the White House, might take one gander at this list and go out to the vegetable garden behind her DC home and shed a few tears. 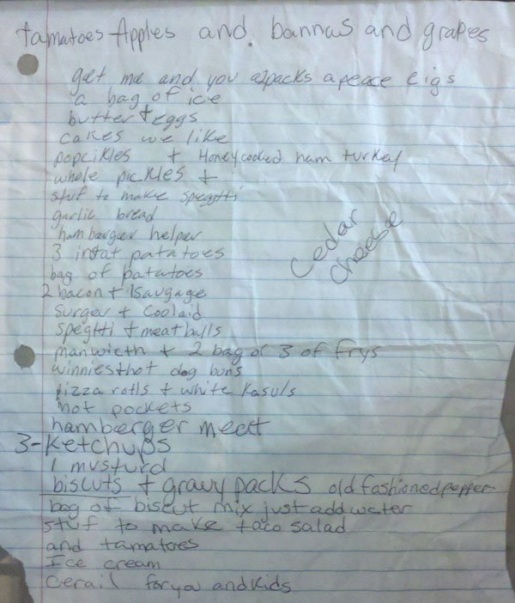 Apparently this list was found in a WalMart. The nutritional value of the paper is probably more healthy than 99 percent of the items written on the list. That is if you can decipher the names of the foods considering the way they were spelled. Who’s up for some “cedar cheese”? Does that come with or without varnish? Don’t be fooled by the “tomatoes apples and bannas and grapes” scrawled across the top of the page. The cigarettes are the next item on the list. How much ketchup does a household consume if you are buying it three bottles at a time? Maybe they read about Chris Voigt‘s vow to eat an all-potato diet. I figure their items entitled “surgar and coolaid” and “cakes we like” will counterbalance any nutritional value of their spuds. All I can say is I’m not sure I’m eager to try a version of “spegtti and meatballs” whipped up by this master chef.